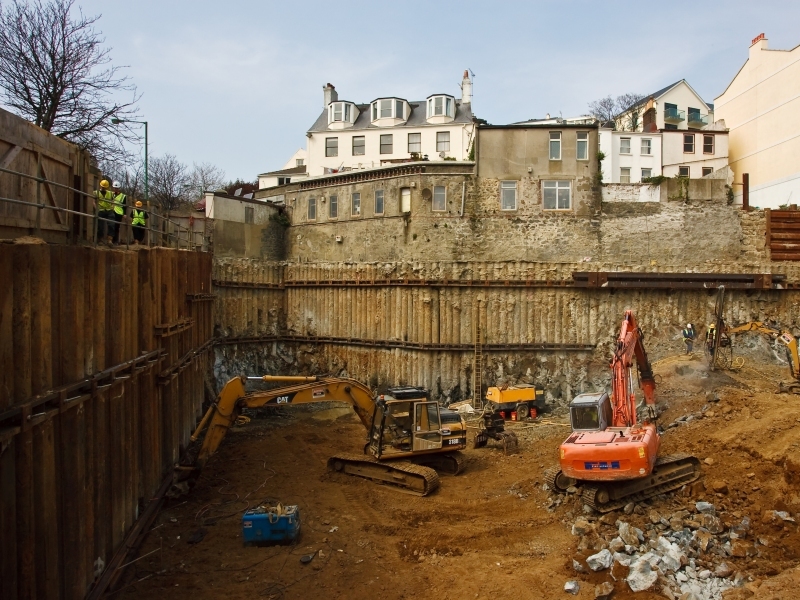 DAWSON-WAM carried out ground works, retaining wall installation, foundations piling, site excavation and rock removal in preparation for the construction of a new complex of prestige apartments and offices on the seafront overlooking the marina in St Peters Port, Guernsey. With the first phase, a five storey Royal Bank of Scotland building already constructed, phase II is a prestige 'U' shaped residential apartment building fronting onto the esplanade. The site slopes steeply downwards to the seafront and the ground stratigraphy comprises made ground overlaying medium dense to dense sand, which in turns overlays weathered gabbro becoming more competent depth. The northern wall clearly shows up the rock profile line falling across the site towards the sea and the eastern wall required the longest piles, even though the retained height along this wall is shallowest on the site. When installation of the largest retaining wall on the west side of the site commenced it became apparent that the hidden rock profile on the site mimicked the exposed rock outcrops along the coast line. Piles only three meters apart were hitting the bedrock at up to two metres difference in level. Pile depths ranged from 9m to 14m with all the tubular piles socketing one meter into sound gabbro rock. Steel tubes - each tube having its own sacrificial rock cutting teeth - were screw driven into the rock with simultaneous reaming out the centre of each tube as it was being driven using the rig's counter rotating double head auger drive. These piles are fitted with steel clutches to either side into which the sheet piles key. The clutches are all welded for water tightness and wailings are bolted onto the excavation sides - 2 on the shallow side of the slope, and 3 on the deep side. 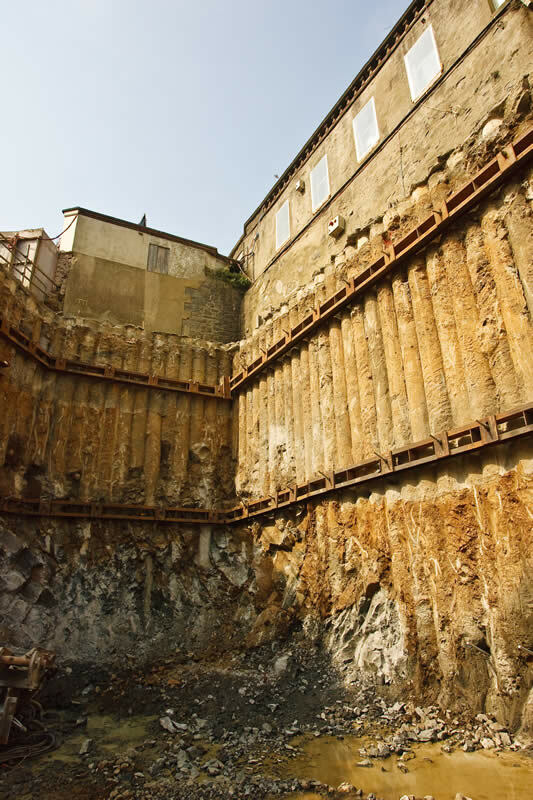 Sheet piles are extended 1m below the excavation level. Should additional load bearing capacity be required, there is the additional option of grouting the tube cores. 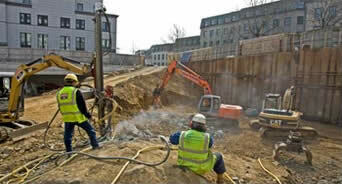 DYWIDAG bar ground anchors and waling bars are a temporary support mechanism. 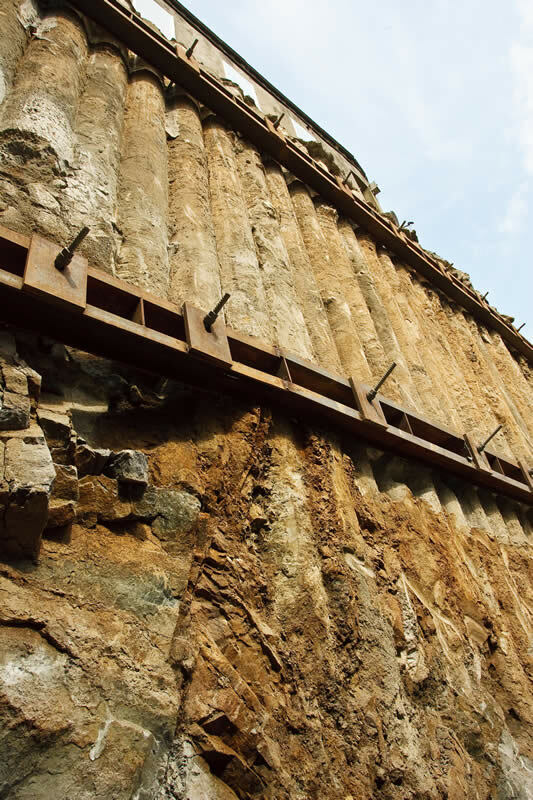 In the Phase III site enablement works, the combi wall technique is being repeated along the road boundary with a secant piled wall of 457mm diameter piles reinforced by "H" beams on the party wall of a terrace of pre-existing housing. Extensive rock drilling and splitting of gabbro outcrops within this third site was also a requirement.